Easy office sharing and network readiness are a couple of Canon i-SENSYS MF-216n printer advantages. Scanning, copying, printing or faxing are all simple, fast and dependable with the Canon i-SENSYS MF-216n mono laser all-in-one printer. The first page of a copying or printing job can be created in a mere six seconds. Ethernet and USB connectivity can both be done with the Canon MF-216n multifunction printer. This primarily black coloured device weighs in at 11 and a half kilograms and boasts dimensions of 360 x 441 x 390mm. 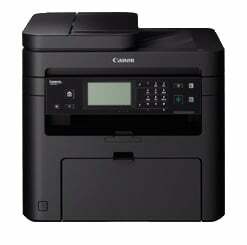 The main differences between the Canon i-SENSYS MF216n and the Canon i-SENSYS MF-212w are that the i-SENSYS MF-216n features a fax machine, a 35-page automatic document feeder enabling users to scan or copy several pages at once, and an extra line on its six-line LCD control panel screen. Changing and recycling Canon i-SENSYS MF-216n all-in-one cartridges is easy and fast because each black Canon 737BK cartridge includes the toner, drum and cleaning units. Copies and prints produced by the Canon MF-216n mono laser printer are of professional quality, while advanced colour scanning can be done at up to 9600 x 9600dpi. Scans can also be sent to any connected computer. Users can also easily see important information displayed on the Canon i-SENSYS MF216n all-in-one’s control panel because the LCD panel can easily be tilted. The all-in-one i-SENSYS MF216n laser multifunction printer can scan, but not copy or print, in colour. USB interface cables must sometimes, and data cables must always, be purchased separately.